Not gonna happen, judge, and I suspect you know that. But we do those legal protests anyway. I go out every Sunday to stand for peace because I have two daughters to answer to and “I was too busy to do anything,” is not an acceptable excuse. There have been times, at demonstrations I have attended, where hundreds of people came out to protest and the media ignored it. No TV cameras , no newspapers. The next day, it was as if nothing happened. But I have also been at demonstrations where people got arrested for acts of nonviolent civil disobedience. Guess what—front page of the paper. Lead story at 11:00. When the first goal is to raise awareness, to provide people with information the government would like to keep secret, media coverage is essential. And with only a few exceptions, most media require the drama of arrests before they will cover a story that includes criticisms of the regions largest economic powerhouse. Of course, that is one of the fundamental tenets of nonviolent direct action, a truth that was lost on the last judge who lectured us, in federal court. The judge said he was “obviously” a fan of Gandhi—but he’s like a fan that cheers for Derek Jeter but has no clue how hard it is to field a hard, low one-hop line drive just outside the baseline behind third base, turn, and deliver the ball on target to first base. The fan admires the pure beauty of it, knows it was hard as hell, knows he could never do it, but that’s as deep as the understanding goes. II. Channel this energy into working to change policy—make democracy work. The second suggestion, offered by Judge Amul Thapar from the bench in federal court in Knoxville, Tennessee, was even more tortured. He praised the defendants before him for their intellect and clarity of thought. He noted that they had legions of supporters because he had gotten hundreds of letters and thousands of signatures on a petition. “Channel this energy toward changing policy in Washington, DC,” he said, implying they could not help but be effective. Second problem: Really? Do you really think smart, articulate people have not written hundreds of letters to Congress, haven’t signed petitions, haven’t gone to the nation’s capital to press the case? I’ve met with three different Secretaries of Energy and dozens of other officials; I’ve done briefings on Capitol Hill with former Arms Control Ambassadors and the President of the Union of Concerned Scientists. I’ve served on state and federal advisory committees. I’ve spoken at scores of public hearings, written op-eds in the local newspaper, penned letters to the editor, been quoted in a dozen major national newspaper and magazines, been interviewed hundreds of times, done radio and TV for half a dozen international media outlets. And I’m here to tell you, judge, it doesn’t work that way. Maybe you can ring up Mitch McConnell and get put through to the Senator, but I have to shame our local Senator into even sending a staff person to meet me outside—they refuse to allow more than three people to visit in their office at one time. I’ve gone to DC to meet with a Representative for an appointment and instead had a five minute meeting in the hallway with his aide who, for most of the time, found the woman down the hall behind me far more worthy of his attention. I’ve talked to dozens and dozens of Congressional staffers, most of whom have this issue in their portfolio, and the level of ignorance is stunning. I don’t blame them—they have a million things to keep track of. But when I take a Department of Energy document to them, open it and show them where it says the new bomb plant will cost 2,400 jobs, and they insist on denying it—well, it doesn’t encourage me to put a lot of faith in your way. Or, another thing I am pretty sure would work, because I’ve studied a little on how things get done in Washington: How about if we just give some major campaign donations to our Senators—it would only take half a million dollars, I bet, to outbid Babcock & Wilcox, Lockheed Martin and Bechtel. Then my eight page letter to Lamar Alexander would probably warrant more than a form letter with a paragraph inserted about nuclear energy (though I wrote about nuclear weapons) and a machine signature. I’d go in the “first name file.” They have those, you know. One summer, I helped a friend who was interning file the first name file letters for a Congressman from South Carolina. That’s how democracy works, Judge, in case you don’t know. The chance of Michael Walli getting an appointment with a Senator or Representative are zero or less (those DC people don’t actually have a real one of either, you know). What I’m equally sure won’t work is 16,000 signatures on a petition. The White House requires 100,000 signatures before it will take a petition seriously enough to read it. Nuclear weapons are not a hot enough issue to inspire that many signatures—partly because they are so horrific people don’t want to think about them and partly because they sound so technical people don’t think they can do anything about them and partly because some people are afraid to say they might not be safe without them, but mostly because the fix is in—the money fix, the fear fix, and the politics fix. There is no conversation (without something like a Transform Now Plowshares action to create one) about nuclear weapons these days. About our nuclear weapons, I mean. Lots of talk about Iran’s. Don’t take my word for it. Set aside this case you drew and ask yourself: how many times in the last year, two years, decade, have you given any serious thought or any thought at all to US nuclear weapons production? How many times have you wondered how many warheads and bombs we have? How many times has the nuclear nonproliferation treaty crossed your mind? Even when you heard a news story about North Korea or Iran’s nuclear ambitions, how many times have you questioned our own nuclear practices? See what I mean? Martin Luther King, Jr. said nonviolent direct action seeks to create a kind of crisis in a community, to make a space for a creative tension that challenges the status quo or even makes it untenable, and opens a space for a new reality. That’s the point, Your Honors. The discomfort you feel, looking at these people in front of you who are among the best and brightest in your community, having to sentence them or fine them as though they are bad people or have done something wrong—that’s the tension. That’s one of the reasons we are there, in front of you. Nonviolent direct action has as its fundamental goal shaking things up. It is an honorable tradition. In this country it goes back at least to the Boston Tea Party (though if you consider property sacred you might argue about the nonviolent part of that party). It’s not your normal kind of crime, not committed by your typical criminal. The law can’t take that into account very well, though. Because the law loves order and the beautiful clarity that it brings. The law doesn’t so much like dynamic things like nonviolence when it is loosed in the world or the courtroom. But when things are really messed up, really—like a nation that preaches nonproliferation to others but is busy building bombs and bomb plants—and no one in power wants to do anything about it, and most people in power actually have disincentives to do anything about it—what is a responsible citizen to do? If the mess up is obvious enough, and distant enough, and done by someone else—trains full of Jews heading for Dachau, for instance—we know what a responsible citizen is to do, and judges and prosecutors, too. We wrote the Nuremberg Code, we the US. But God help the citizen in the United States who sees a terrible wrong being done by the government and tries to raise the alarm. I could go on, but I think my point is clear. Nonviolent direct action is required of us because the government responds to nothing less. It is required of us because our consciences and our unborn grandchildren—and yours—insist we do all we can on behalf of the planet and the future. It is required of some because they feel a divine imperative; the God they follow requires them to beat swords to plowshares and blesses peacemakers. It doesn’t seek an end in itself—it seeks to open a conversation, to encourage jurists, prosecutors, defense attorneys, the public, to search themselves to see what they can do and what they should do. Of course there is a price to be paid. That’s why Ramsey Clark said the main thing it took was courage—more than most of us have. But to those rare few who listen to voices; who don’t throw caution to the winds but carefully, thoughtfully, gently lay it down and then pick up a hammer; to those who find themselves surprised to be doing courageous things and go on and do them, we owe a debt of great gratitude. We may even owe them the future. 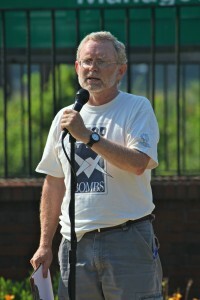 Ralph Hutchison is an activist with the Oak Ridge Environmental Peace Alliance.